Doctor’s Note: This post was written as an email to a patient who has seen us for several conditions successfully, Joe. Trusting our care, he asked us if we could help his friend who has post-surgical pain. Pain that has not gotten better, even with surgery. We told him we didn’t know if we could help, only that adhesion is the most common cause of pain and it is almost never addressed by any healthcare providers. Therefore, it’s always worth a shot if we test for adhesion and feel it restricting motion on the first visit (which usually means a 5-treatment plan to see if our diagnosis is right, not 20-30 like most physical therapists or chiropractors). First, I appreciate your trust in us to even ask me about your friend with post-surgical pain. It means a lot to us that you care about your friend and that you think we might be the person to help him. We never want to break your trust. First is the conversation that you can have Bill. I wrote the whole thing out so that you can see the flow of how it will go. Second is the psychology behind the questions. Only in helping him see things from our perspective can we really fix his pain. At this point, conventional healthcare’s most compelling story has won him over. And failed him. Our evidence is how much he appears to be suffering, based on what you said. He already walked the conventional path and is still at the exact place when he started pursuing healthcare options. Now, when he dreams of being at the pinnacle of his health, pain-free, all he can see in his way is fear, struggle, and hopelessness. 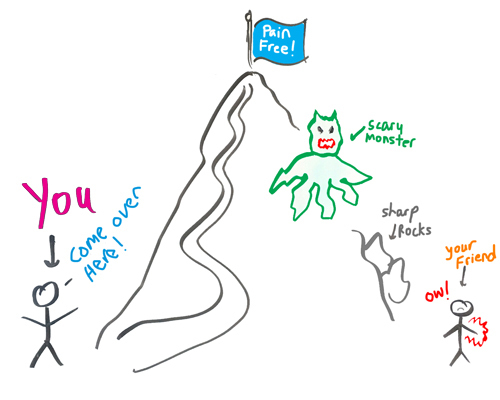 These emotions occur like scary monsters and sharp rocks on one’s path. He cannot see that you see a better path to becoming pain-free. In order for him to walk the path of becoming pain-free, he needs to see things the way you see them. You need to show him new perspective. You get him to see what you see by telling a more compelling story to help him, fix the pain, and stop the suffering. With a better path to walk, he will take action. When he is making progress on the path, he will shout down to the base of the mountain, thanking you for your love and support. Read on to see how you can shout out loud and clear to powerfully to serve your friend. See the questions in the next section to determine when the right time is to have this conversation. Bill: I can’t believe my shoulder is still hurting. I thought this surgery would’ve fixed it. The orthopedic doctor and physical therapist don’t know what to do. Joe: Has your pain changed at all? Bill: It has improved 20%. Not enough for me to think about anything else despite my shoulder pain everyday. Joe: How long did you have your pain before the surgery? Bill: Oh, forever! At least ten years. Joe: And what did you try before the surgery? Bill: I tried everything. Chiropractic. Physical therapy. Acupuncture. Steroid injections and oral steroids. Nothing worked. Joe: Hmmm. Why don’t you think the surgery worked? Bill: I have no idea. Joe: Maybe your pain wasn’t only caused by the labrum tear? Bill: After hearing you say it, that seems obvious to me now. Joe: How is the pain affecting your life Bill? How do you feel every day? What has it been like to have this for over ten years and to experience something has drastic as surgery without improvement? Most importantly, what are you feeling emotionally? Bill: Joe, I can barely live with this pain. It takes up most of my every waking thought. At this time, I struggle to do my job and be present with my wife. A few years ago, I could live with it and I accepted it. I didn’t realize it would get this bad. I’m seriously frustrated that surgery didn’t work. I’m beginning to lose hope. It’s making me depressed. Joe: I’m so sorry Bill. I know how frustrated and depressing pain can be. Remember that I’ve had chronic elbow, shoulder, and low back issues myself that Barefoot Rehab helped me with. But before we discuss if that’s an option, I’m wondering what your life would look like if this pain weren’t here? Bill: Are you kidding? I’d be ecstatic. Without pain, I could do anything. I could be fully present with Pam (my wife) and I could perform at my best at work instead of the half-assed 50% I’ve been giving it. I could play more with my kids and not give them the annoying “I’m sorry, I can’t play with you guys because my shoulder hurts too much.” Most importantly, I could feel joy every day instead of horrible pain. Joe: Wow, yeah. I can see all of that too (nod your head up and down). Sounds like your life would be way more meaningful. And that you could live a life that you love, without regret. Does that sound right? Bill: Well, yes. When you put it that way, I’m seeing how precious life is. I took pain-free living for granted. Joe: We’ve already discussed the doctors I trust at Barefoot Rehab. They helped me when no one else could. They don’t help everyone, but they’re worth a shot. Adhesion is the most common cause of pain. It is treated conservatively and almost no other doctors are talking about it. Are you open to seeing Dr. Chris or Dr. Curtis? Joe: If you see them and they find adhesion, you’ll have to do exactly what they say. They will be strict about their orders. They need to be in order to not fail you. Their practice is built on patient success. Are you willing to do exactly what the doctor says? It is important that you understand the why behind each part of the conversation. Otherwise, you may be apt to take shortcuts. Shortcuts don’t work. 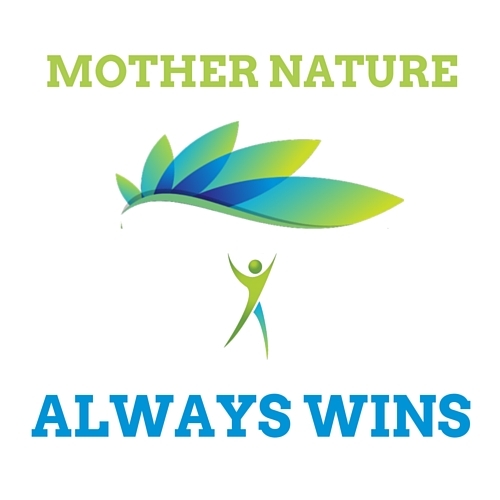 We have to respect Nature’s process. We can’t yell at the seed to sprout, leaf, and flower in a day. We have to respect the seed’s process and trust that it will flower over time, guaranteed. In the same way, we have to respect Bill’s process. You cannot bring up the conversation to him. He needs to bring his pain to the conversation with you. It can be complaining or venting. He may want empathy. Or it can be a cry for help. Either way, this is your opportunity to serve him. This is significantly more effective than you going to him based on your observations of his pain. If he hasn’t fully gone through post-surgical physical therapy and his orthopedic doctor hasn’t given his final word on discharge, you must nudge him to finish his care. Bill is still in the process of recovery and he needs to finish it. The pain he is having may still be post-surgical pain from the inflammation and damage from the surgery itself. We need time to let the inflammation pass. For those of you familiar with dysfunctions, this is an inflammation block that requires time primarily and diet, sleep, and healing thoughts secondarily in order to heal. You want it to be bad and really intense. People don’t make choices and change based on physical pain. We are way more likely to follow through based on emotional pain. The more he emotionally feels the pain, the more likely he will be to fix his pain. This is metaphorically, digging the emotional knife into his side for the purpose of helping him. 2. How long did you have your pain? Dig the knife in some more. 3. What did you try before surgery? 4. Why don’t you think surgery worked? You want Bill to see, for himself, as much as the problem as he can. You want Bill to see why conventional healthcare failed him. 5. How does this pain affect your life? How do you feel? How much has it cost you? One final twist of the knife before you help paint Bill a picture and let him write a fairy-tale story. 6. How would your life change if you weren’t in so much pain? Watch him light up as he dreams of what is possible for him. 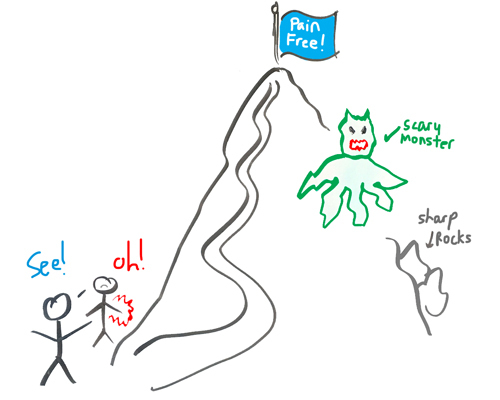 The contrast of where he is (in pain) and where he could go (being pain-free) will be the reason for taking action. 7. It sounds like it would be pretty life-changing to be out of pain (as you nod your head up and down) and that your life could take on more meaning, yes? You’re empathizing with him. You’re helping him feel heard and supported. Nodding up and down is subconsciously helping him feel like you and Bill are one. The more oneness he feels with you, the more likely he is to do what you want him to do. This physical cue comes from the Neuro-linguistic Programming (NLP) world. 8. To get out of pain, you’re going to have to do exactly what the doctor says. Are you willing to do this? This question is key. In person, Joe said that Bill would not be willing to do whatever he was asked to do. Simply, the knife hasn’t been dug deep enough yet. Unfortunately, Bill needs to suffer more. Not just be hurt, but suffer. Emotionally. In his life. If the knife was twisted deep enough, Bill would say “yes” and be willing to do whatever he had to do to avoid the suffering. When the suffering he experiences is greater than his current way of being, the scales will tip and Bill will do what he has to do. Bill has to come to this realization through his own natural processing. The seed sprouts, leafs, and flowers on its own timeline. So do each of us. Frustration, anger, and yelling at the seed don’t water the seed. Time, love, and nurturing do. While he may not take action now, he will remember this conversation with you as he continues to suffer. Because you loved him non-judgementally and spoke to him compassionately, he will come back to you when the pain is intense enough and ask for you to point him in the right direction. I’m going to get fluffy and whimsical here. I have no evidence to support what I’m going to say, but I strongly believe it works. In Zero Limits, Joe Vitale explains how master teacher Dr. Ihaleakala Hew Len used the Ho’oponopono mantra to heal a psychologically sick medical ward in Hawaii. How did he use it? By saying the mantra, to himself. Without any of the patients around him. I use the Ho’oponopono mantra daily. On patients who are suffering but refuse care. On people who I’ve hurt that will not forgive me. With the mantra, I’ve found that I can name people off the top of my head that eventually pursue care. And forgive me. While I don’t know if the world is suffering less, my heart tells me that the world is healing. Hence, my obligation to share the mantra with you. I believe that there’s an answer for every pain problem. As long as an individual didn’t abuse himself too much and too long. Or was born with issues that cause him to be in pain despite not doing anything wrong when it comes to his body. I’m sorry. Your pain is not caused by adhesion. I cannot help you. And I don’t know who to send you to. 1. Continue to search for answers. When you overhear a compelling story by a friend of what helped her, pursue knowledge of their tools and philosophy. See if they claim to be able to help a percentage of people who suffer with what you suffer from. 2. Cultivate your mental, emotional and spiritual presence. Deal with psychosocial issues, especially ones from early childhood. Finding meaning amidst the suffering. Victor Frankl’s Man’s Search for Meaning is the foundational text on meaning. 3. Fill your other life buckets. The other buckets include diet, toxin-free living, connection with others, positive thoughts, flow-induced activities, etc. Jonathan Fields discusses his Connection, Vitality, and Contribution life buckets in How to Live a Good Life. 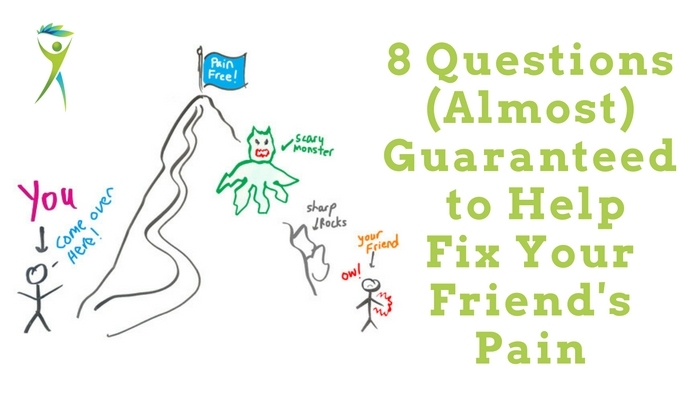 With this tool-belt in your arsenal to help your friend’s post-surgical pain (or other chronic pain that has not been fixed), you are equipped (guaranteed) to help your friend get help for his pain. You are equipped (almost guaranteed) to fix his pain. When he’s ready to choose a pain doctor, have him take ten minutes to read The 7 Biggest Mistakes People Make When Choosing a Pain Doctor to save him some trouble if he doesn’t live in New Jersey or New York City. How did the conversation go with your friend who is in pain? Did he get help immediately? Did he need to wait? What was his answer if it wasn’t adhesion? Share your experience below, if you’re open to it.